The Ultra™ Easy Carry Hamper effectively combines the valued features of portability and capacity all in one. 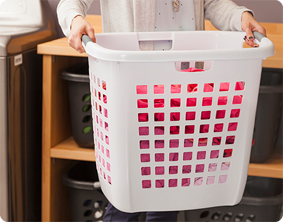 Lifting large loads of laundry is made easier and more comfortable because of the sturdy construction and reinforced rim. The integrated handles on all four sides allow for easy lifting and carrying through narrow doorways, hallways, and up and down stairs. The polished finish, unique shape, and attention to detail will provide an attractive and efficient laundry solution in your home. 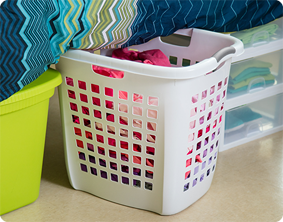 When not in use, the laundry baskets stack neatly and nest together creating more efficient storage space. 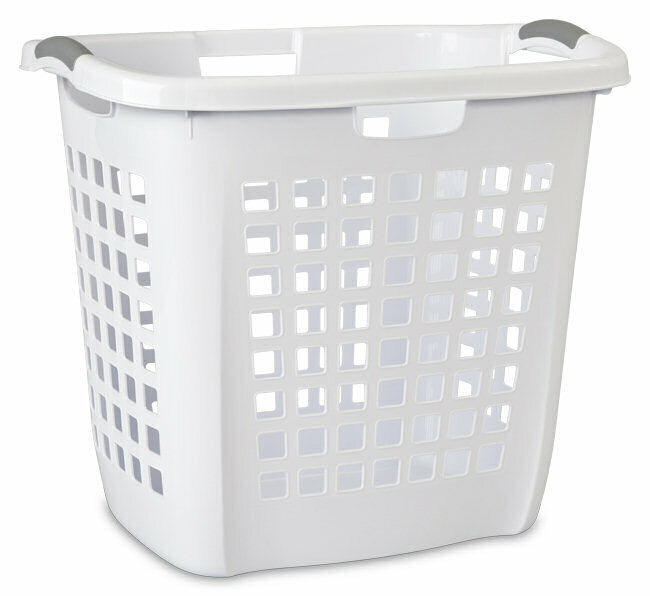 The overall dimensions of this item are 22 1/4" L x 17 3/8" W x 19 7/8" H.
Overall Assembled Size: 22 1/4" x 17 3/8" x 19 7/8"
A polished finish and sleek modern design make this hamper a stylish addition to any laundry room, bathroom, dorm room, or bedroom. Integrated handles allow for easy carrying from any side. 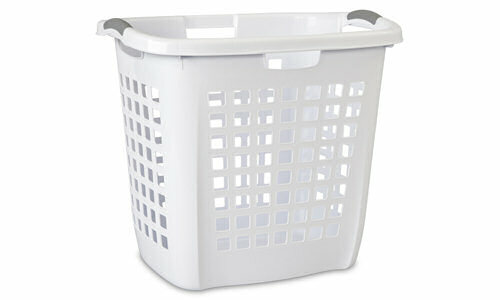 Ultra Easy Carry Hamper is rated 4.8 out of 5 by 4. Rated 5 out of 5 by DrivingPony from Not just for laundry Here's a use many may not have thought of- I keep one of these in my barn. It makes filling hay nets a breeze! I can slip the net into the basket, much like putting a bag in a trash can. The net stays open- its a great size for tossing in a few flakes of hay, pull the drawstring up and I'm on to the next one. What used to be a hassle and take a lot longer (20-30 minutes for 3 nets) is now done in a matter of seconds. THANK YOU Sterilite! Rated 4 out of 5 by myndseye711 from Great Perfect size because it is not too large to carry. I like how it lets the clothes breathe. It is also easy to clean and easy to carry on your hip. Rated 5 out of 5 by webeselen from Greatest hamper ever This is the greatest hamper ever. I have one in each of my kids' room. They are very durable. Roomy enough to hold the weeks clothes. And very easy for them to carry to the laundry room. I also keep on in our bedroom and the bathroom. They make life much easier at my house. Rated 5 out of 5 by Ecuamarina from I love it!! Very practical, many uses. I have many around the house for laundry near the pool to keep toys, etc. Because I live in Florida I used to get scared of the other baskets that i have before because any animal(lizards, spiders,or little frogs) that get inside would died there and my kids go scared of that too, but you can see through them so nothing get out of my sight with them and also I found easily everything and help me to keep my house clean and neat.